Being very familiar with Balinese culture, I was surprised to find, on my first visit to Cambodia in 2012, that temples and temple ceremonies looked very familiar, with flowers and much gold gilding everywhere. 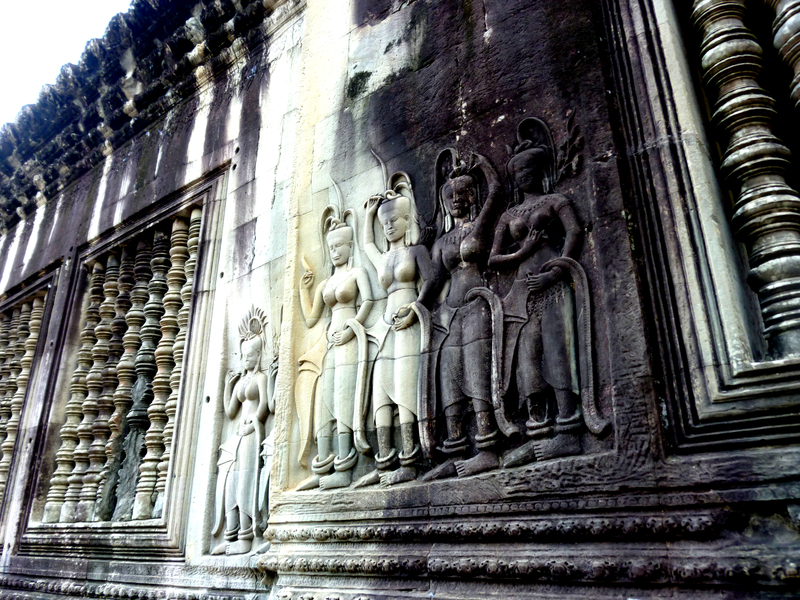 The Apsara figure translates as “celestial nymph” and I saw many of them carved in the temples at Angkor Wat waving flowers in dancing poses (as Apsaras) or facing us as temple custodians ( Devatas). 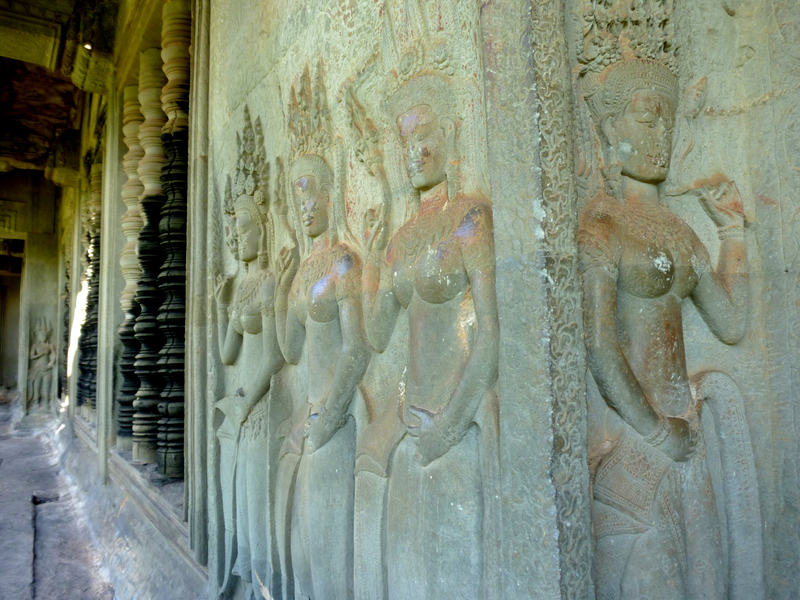 They also appear in the ancient temple of Borobudur on Java, and the Legong dancers depict the Balinese version. These gals are pretty popular around here in South East Asia. 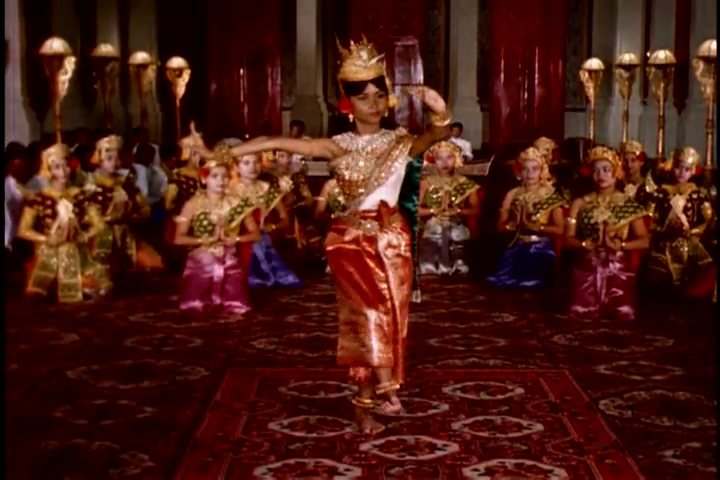 In the 1940’s Queen Sisowath Kossamak became a patron of the Royal Ballet of Cambodia and re-created the ancient apsara dance by educating her first grand daughter, Princess Norodom Bopha Devi, to become an Apsara dancer. But the company was almost annihilated by the Khmer Rouge. After the troubled years, the few survivors came out of hiding in search of each other and managed to slowly build colonies to revive the art of Khmer classical dance. Many dances and dance dramas were recreated at the Royal University of Fine Arts and in 2003 it was inducted into the UNESCO Intangible Cultural Heritage Lists. Dance attire in Khmer classical dance is extremely decorative. It consists of a sampot sarabap metallic thread sarong wrapped around the lower body, then pleated into a band in the front and secured with a gold or brass belt. Worn over the left shoulder is an extensively embroidered shawl-like garment . Jewelry includes an embroidered collar, a large filigree square pendant, various types of ankle and wrists bangles, an upper arm cuff on the right arm, and body chains of various styles. There are several types of crowns ( Mokot ksatrey), which denote the ranks of the character. Flowers also play in important role in Apsara costume: a rose above the right ear and a floral tassel attached to the left side of the crown, tassels and garlands in jasmine. If you are ever in Cambodia do go along to a performance and support a beautiful ancient art that was very nearly wiped out.